Congratulations! You have made the decision to get orthodontic treatment at our Orlando, FL office. Now it’s time to choose among your various appliance options. Traditional metal brackets and wires, lingual braces, a series of aligners—they all have positives to recommend them. And for some people, ceramic braces are the clear favorite. 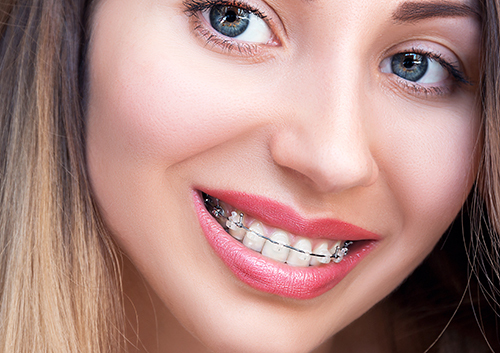 Ceramic braces work like regular metal braces. Brackets are bonded to the front of each tooth, and rubber bands surrounding the brackets hold the arch wire that gradually moves the teeth into alignment. Ceramic braces, however, use brackets made of clear or tooth-colored ceramic or porcelain which blend beautifully with the color of your tooth. The elastic ligatures, or rubber bands, can be chosen to match the brackets or your enamel. There are self-ligating ceramic brackets which don’t use bands at all. Technology is even working on ways to make the arch wire less visible! The end result is braces that are almost undetectable. If you want a less obvious appliance for professional or personal reasons, talk to us about ceramic braces. As always, there are other factors to consider before you decide, which we will be happy to discuss with you. Ceramic braces might not be ideal depending on the amount of alignment and bite correction that is needed. They might also take a bit more time to bring your teeth into alignment. We will be able to tell you if ceramic braces will work for you and if they might require a longer period to move your teeth to their perfect position. Brackets can sometimes be somewhat larger (though this isn’t always the case), and, because they can be abrasive, are often recommended for upper teeth only. This way, the lower teeth will not impact, or be impacted by, contact with the upper teeth. Oral hygiene can trickier with ceramic braces. Although today’s brackets aren’t as prone to staining, you still need to be careful to brush away the plaque that can accumulate around the brackets. And the bands are susceptible to staining by the usual suspects—coffee, tea, colas, blueberries, or any strongly colored food or beverage. Costs will differ depending on the treatment method you choose. Talk to us about cost comparisons with other orthodontic treatments. Ceramic braces, because they are so much less visible, are a popular orthodontic option, especially for older teenagers and adults. If you are interested, talk to Dr. Diaz about this effective way to straighten your teeth—discreetly. Ceramic might be the clear solution for creating your lasting, beautiful smile.